Thanks, Blessings, Gratitude, Thankful: These are the words that flow out of November. 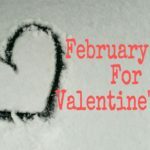 This is one of my favorite months and I love the days that lead up to Thanksgiving. 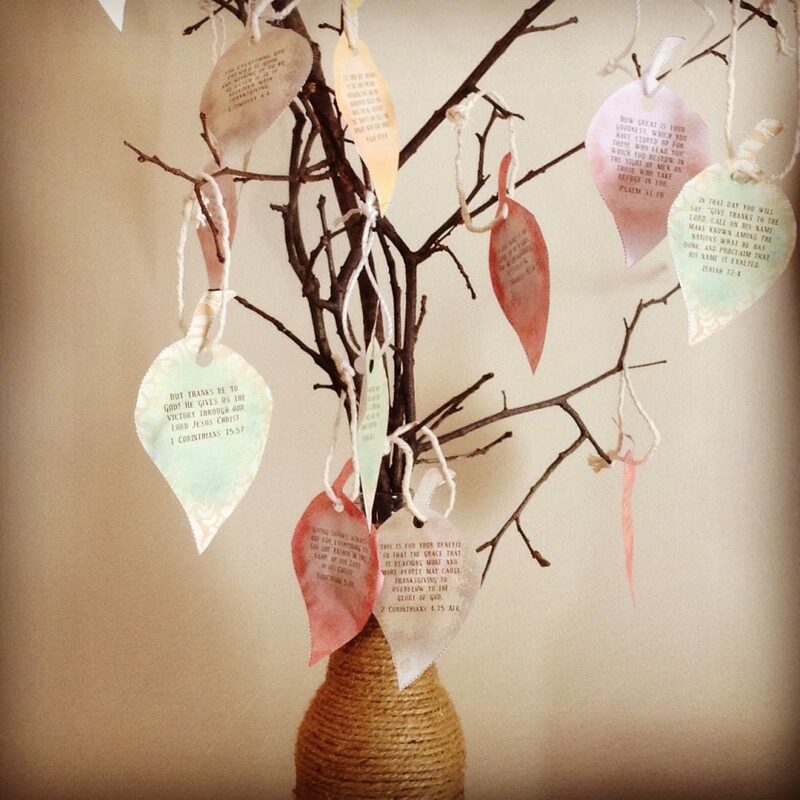 I am reminded of the importance of gratitude in my life and that I need to start my Give Thanks Tree. 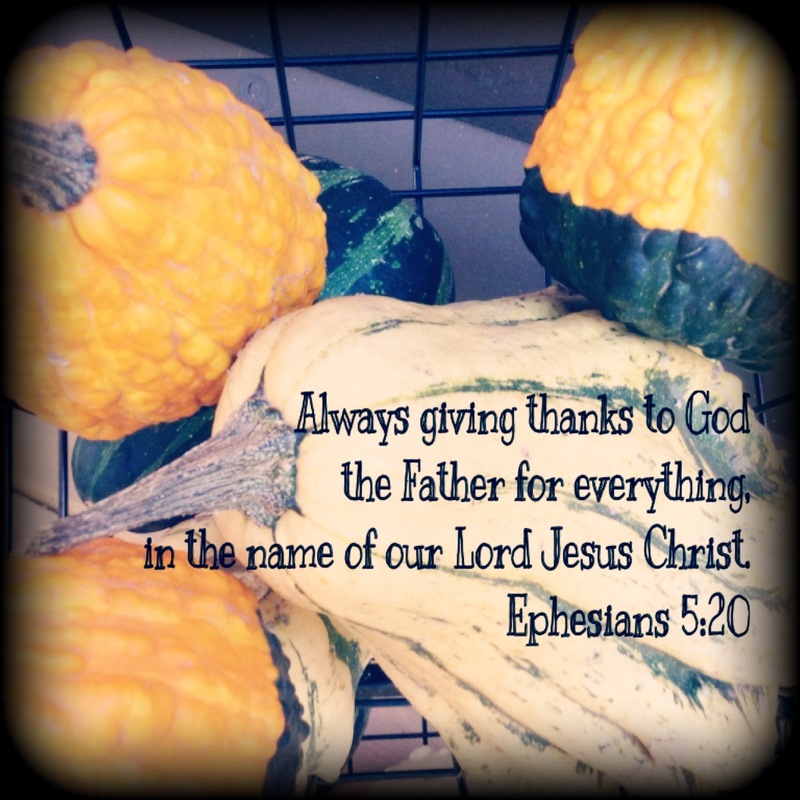 Thankfulness is set prominently on my table as a way to prepare myself and others for November. 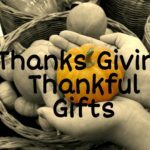 Gone are the days when my kids were preschoolers and November was full of activities to teach our kids Thankfulness. 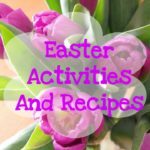 Now I take any of the traditions and habits we started with the kids and sometimes just do these things for myself if the kids are not around. 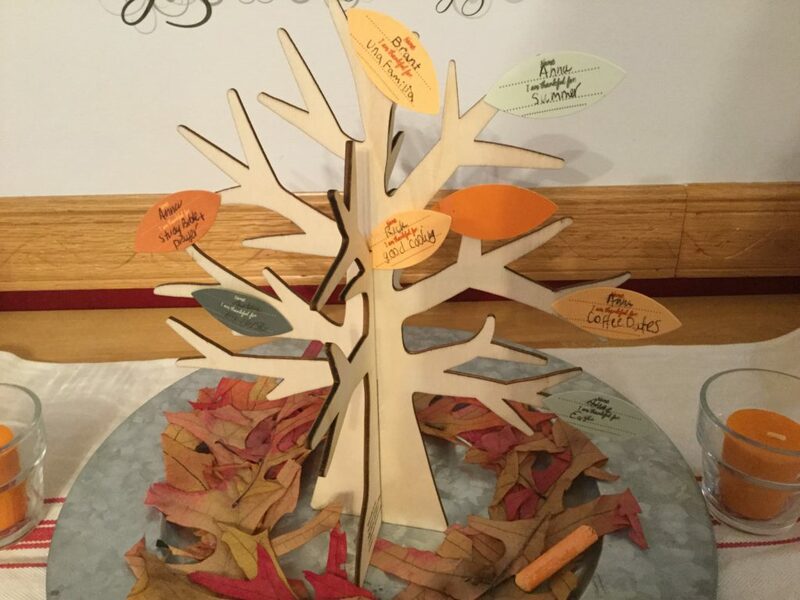 One year I found a wood tree from Target with stick-on leaves to write what we are thankful for and place on the tree. Since I only found this a few years ago, I did this for mostly myself. I would have to say it was fun and meaningful and I did have our son and my husband add their thanks too. 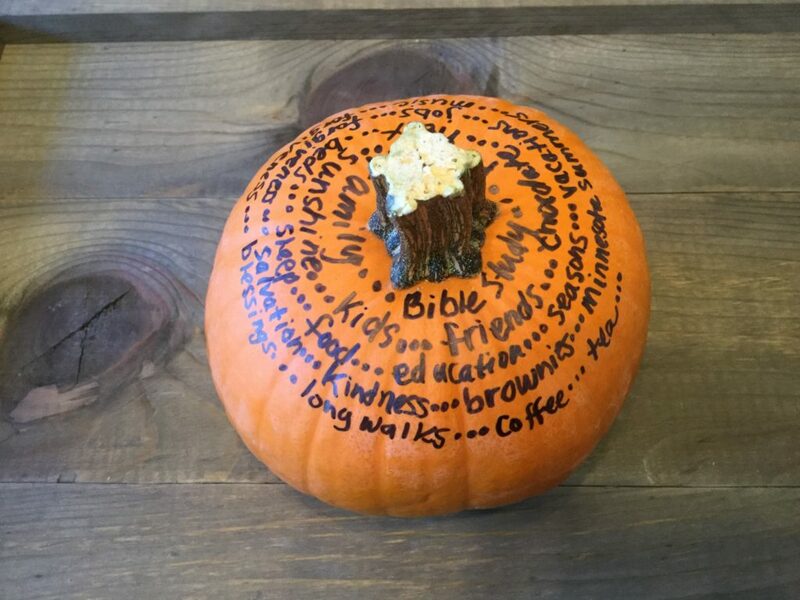 Pumpkin Thanks: Find a small pumpkin or gourd and write what you are thankful for around the pumpkin each day. This is what it looks like. I just found this idea and it’s another easy way to add Thanks all month. 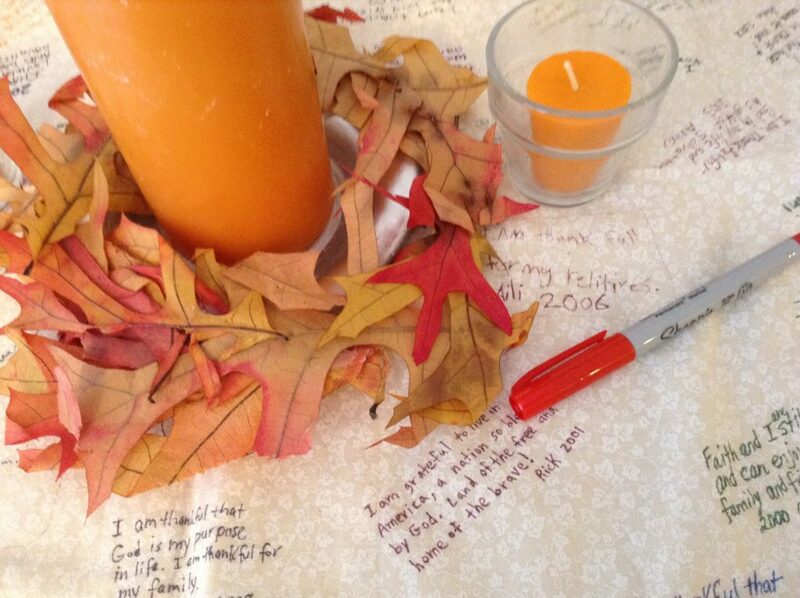 Table Runner of Thanks: Finally, this tradition is my favorite and I started it when my oldest was in preschool. My sister made me a table runner in a cream color. I found pens that can write on fabric and won’t wash off. I used my scrapbooking pens (Micro pens). Test the pen on the fabric to see how it works. 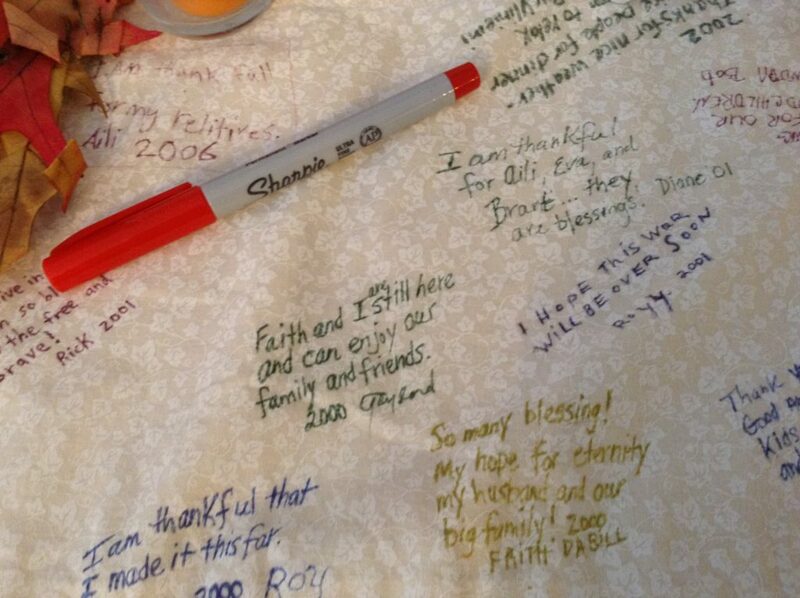 If we had Thanksgiving at my house I had everyone write what they were thankful for on the table runner. I kept it on my side board, so gravy wouldn’t get spilled on it. We walk by and read the comments from years gone by and laugh and reminisce. I love reading the thanks written by my dad and my husband’s grandparents who are now in heaven and shared Thanksgiving with us one year. I also enjoy the thanks written by the kids when they were little and the items I wrote down for them when they were too young to write. Such as: Aili prayed for a brother and she got a baby brother this year 2001. Brant got a mouthful of teeth 2002. I am thankful for Barbies. 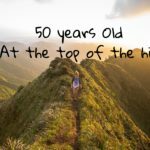 Now that my oldest is 21 years old, I am so glad I started this. We usually have family night once a week so this is when we talked about Thanksgiving and read from the books. 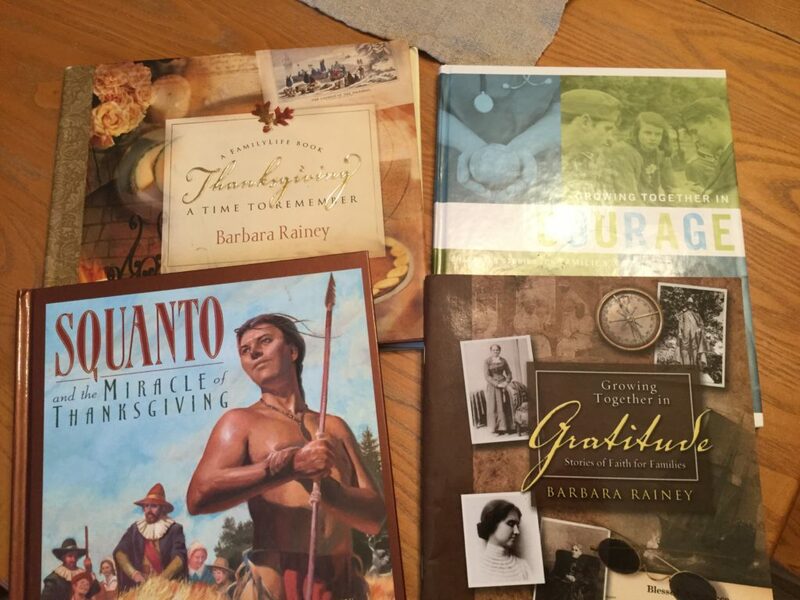 Every week the kids learned about the pilgrims and the history of our Freedom we all enjoy in America. Thanksgiving Bingo: Finally on Thanksgiving after the meal has been eaten and we are waiting for dessert we play Thanksgiving Bingo. 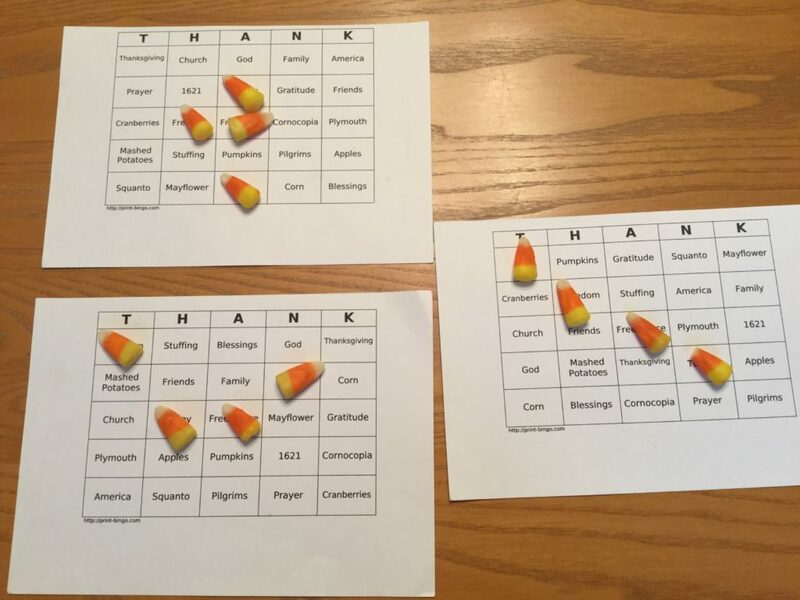 I made bingo cards from a bingo game generator online and added words like pilgrims, pie, God, thanks, turkey, etc. and made as many cards as allowed. We all play or take turns playing and the winners get small gifts we purchase such as chocolate, nuts, books, ornaments, canned goods, etc. This makes it fun. I quit wrapping the gifts so you can eye the gift you want and talk about it until you win. When not at home we take the game to my aunt’s house and play with the larger family. We cover the words with harvest M & M’s or candy corn. (You need to buy these in October, so plan ahead or they may be gone.) Sometimes the candy gets eaten but that’s okay. We play until the prizes run out or we are ready for dessert. Designate a bingo word caller or take turns. It is usually an adult because the kids want to win the prizes. 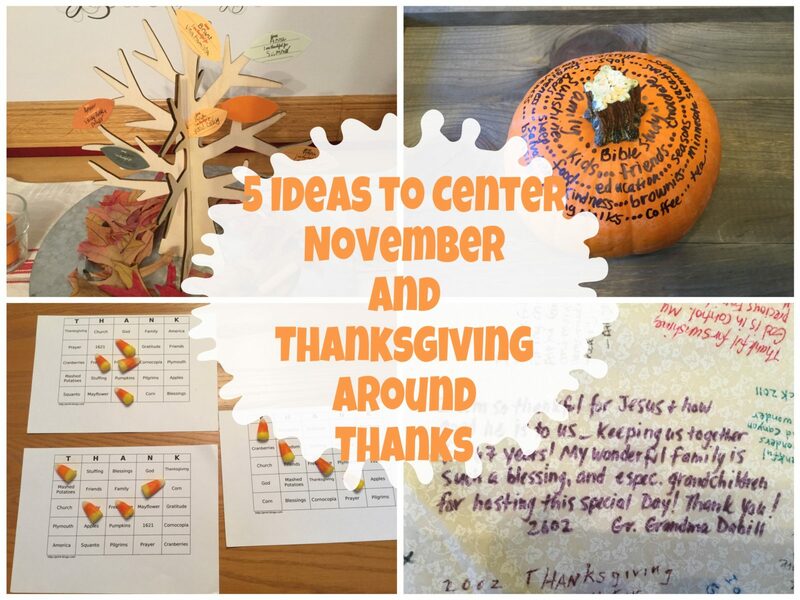 Take time to plan some fun things for Thanksgiving and make the month of November meaningful and the favorite month of the year. This month is about time together, giving thanks all month and the lasting memories. 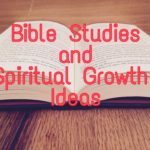 Start a new tradition for the month of November to Give Thanks to God! 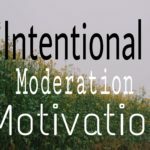 Next week the Blog is on ways you can give to others in November.